Allow us to introduce you to Solvaderm’s Targeted Wrinkle Repair System, the perfect blend of skincare products that work on preventing dehydration and dryness of the skin. Our mixture of anti-aging solutions is the ideal multi-purpose treatment that can counteract aging signs, rejuvenate skin, and protect it against free radicals and other external hazards. Solvaderm’s Age Defying System (Am) is the daytime skincare regimen which the brand recommends to address multiple signs of skin aging all at once. This system rounds up five products that work together to help improve the appearance of sun-damaged and aging skin. The biggest advantage of Solvaderm’s Retinol & Stem Cell System is that it works its magic while you are asleep. This is a nighttime rejuvenation treatment designed especially for mature and damaged skin. It promotes revitalization and renewal by mixing the positive effects of retinol (vitamin A) with stem cells derived from carefully chosen plants. 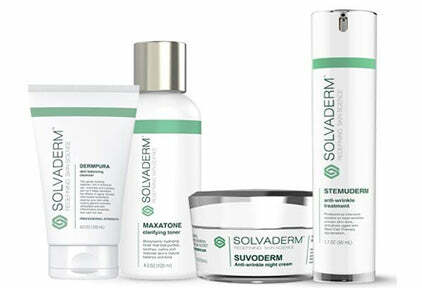 Solvaderm’s Age Defying System (PM) is designed to complement the Age Defying System (AM) skincare regimen. This routine is recommended as an anti-wrinkle night repair treatment which works with your skin’s natural mechanisms that promote skin healing, regeneration, and renewal while you are sound asleep. 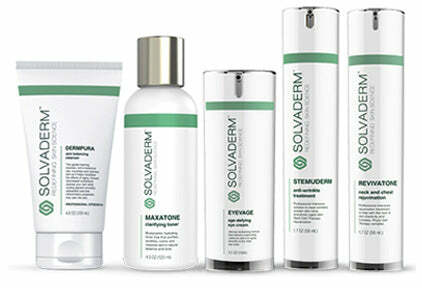 Photo-Age Defense System is a skin care regimen formulated by Solvaderm. This system was made as a premium treatment for skin recovery in cases of UV damage, as well as damage caused by other external hazardous factors. The regimen contains carefully chosen products that aim to deliver optimal protection against UV rays, but also formulations that assist in promoting skin healing, nourishment, and hydration. 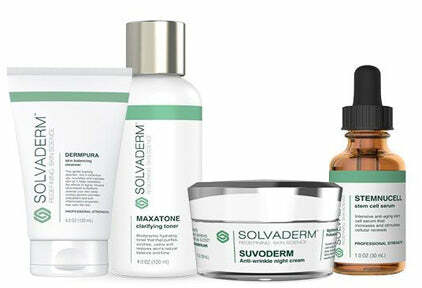 Solvaderm’s Ageless Skin System (AM) is a skincare routine intended to be used on a daily basis. It was carefully optimized for users whose skin is already dealing with aging signs and damage. Solvaderm’s Ageless Skin System (PM) is a nighttime formulation that ideally fits with Ageless Skin System (AM) routine designed by the same manufacturer. If you check it out carefully, there are five products included in this PM regimen and each of them is in charge of promoting skin renewal and healing. 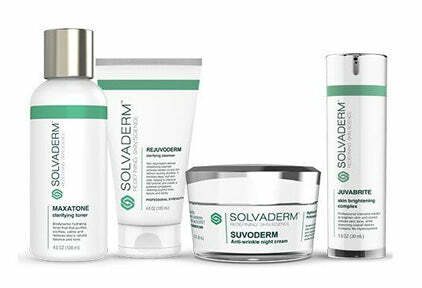 Solvaderm has designed a special Daily Skin System (AM) for people whose skin is not that aging or damaged. This is an essential regimen for those looking to maintain the quality of their skin and prevent or delay aging signs. Solvaderm’s Daily Skin System (PM) improves the appearance of early signs of damage and skin aging while you sleep in sweet slumber. It fades the appearance of dark marks and other skin discoloration issues. Acne Skincare Treatment is a multi-purpose regimen designed by a reputable skincare manufacturer Solvaderm. Its primary benefit is to treat acne, but aside from that, it also helps to deal with acne marks and prevent future breakouts. Skin Firming Cellulite Treatment is the perfect skin care system designed for those who are trying to tighten their skin. 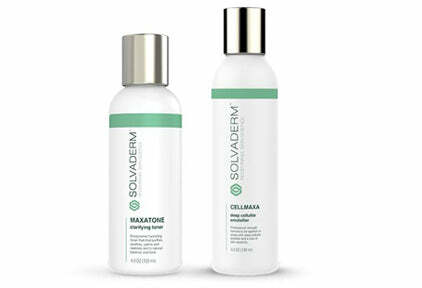 Manufactured by Solvaderm, this system particularly focuses on skin areas that are prone to cellulite. Skin Correcting System (AM) is a premium formulation manufactured by Solvaderm. This regimen is intended for those dealing with hyperpigmentation issues. It features a mixture of several Solvadem products that fit well with each other and work on the joint goal in lightening dark spots and any other discoloration marks that are visible regardless of their cause. This Skin Correcting System designed by Solvaderm has the “PM” in its name because it should be used in the evening. It is also a perfect way to complement the AM regimen of the same name and further boost rejuvenation and repair functions. 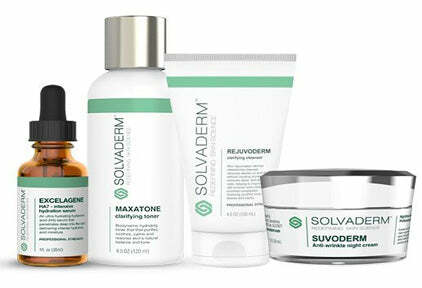 The Advanced Exfoliating System is another phenomenal skincare regimen designed by Solvaderm. It contains three products and only requires you to follow three simple steps to get rid of dull complexion and bring a pack that radiant appearance of the skin you used to have. It is essential to use it regularly and consistently, but this regimen is ideal for re-energizing your skin, smoothening, and lightening it. Solvaderm’s Daily Hydration System (AM) can do wonders for your skin throughout the day. It deals with dehydration and prevents dryness, as well as protects the skin against damaging environmental elements, such as sun exposure. The system contains products necessary to provide a hydration boost that lasts the entire day. Daily Hydration System (PM) designed by Solvaderm fits perfectly with the AM regimen of this system. This nighttime product revitalizes skin efficiently and promotes healing. It is particularly helpful in boosting your skin’s hydration levels making it extra moist and smooth as silk. How Do Creams Improve Under-the-Eye Skin? What You Should Prefer for Weight Loss? How Do Supplements Improve Brain health, Memory And Concentration? What are the Effective Ingredients for Prostate Health? How Does Sexual Enhancers Help Men With Erectile Dysfunction? What Vitamins Are Good for Menopause Symptoms? What is the Best Face Moisturizer for Wrinkles? Would You Like to Place a Phone Order? Please do not use our hotline number to make an inquiry. This line is open for orders only and any request for information will not be entertained. iHealth Fulfillment is committed to guarantee your satisfaction with all of our product offerings. Our Customer Service Center is composed of a team of customer care specialists who are ready to address any question you may have about any of our products or service. Step 1: When you submit a request, our system automatically generates a Support Ticket, of which copies are sent to you and to our Customer Support Department. You will instantly receive an automated email that acknowledges the receipt of your request. Step 2: Your query will be randomly assigned to a Case Manager who will resolve your case. The Case Manager will respond to you via email within 24 hours from the time of your inquiry submission. For emails received on weekends and holidays, the Case Manager will respond on the following business day. What Are The Essential Components For Joint Pain Relief? Please click our "Live Chat" button on the lower right hand corner of the website. We are standing by ready to answers all of your questions!